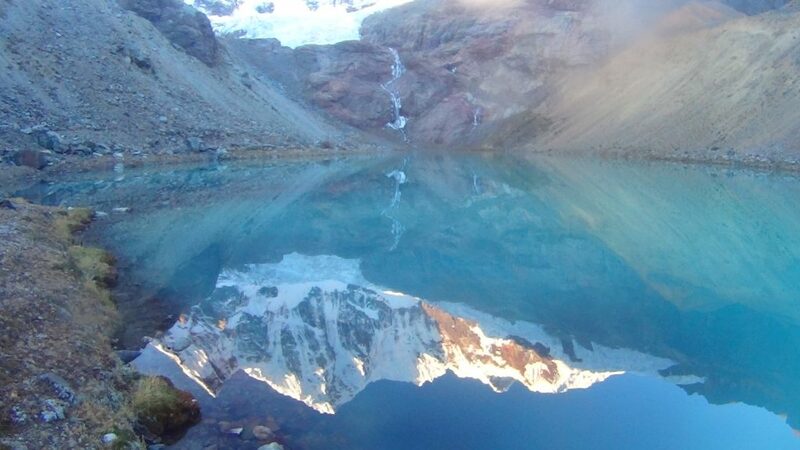 There are two accepted ways of circling the Cordillera Huayhuash. 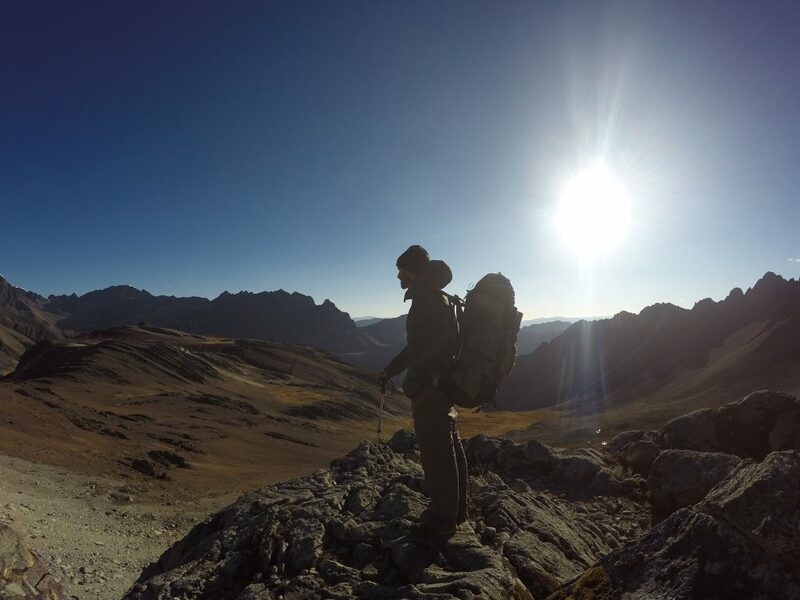 The well trodden 8 day Valley Circuit hiked by thousands a year or the less travelled and partly technical Alpine Circuit that passes much closer to the crazy line of majestic 6000+metre peaks. Both are impressive in their own way. 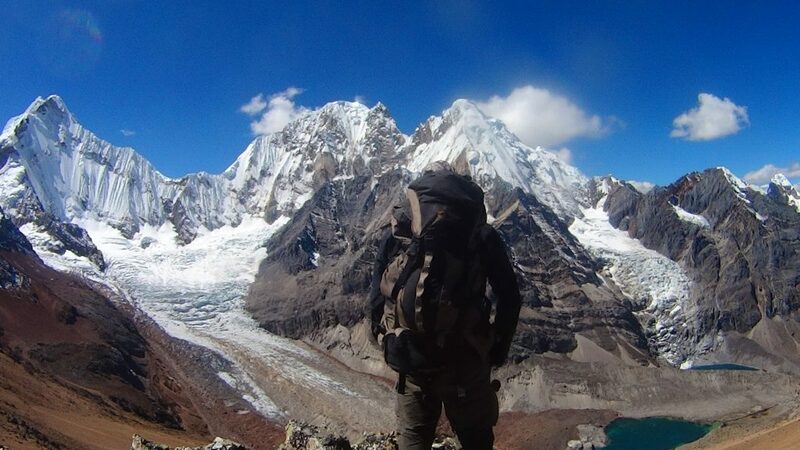 However, with some reasonable navigation skills and experience, the opportunities for deviating from these routes and exploring these mind blowing landscapes is very extensive. (Preparation and caution is obviously required, this is BIG country). 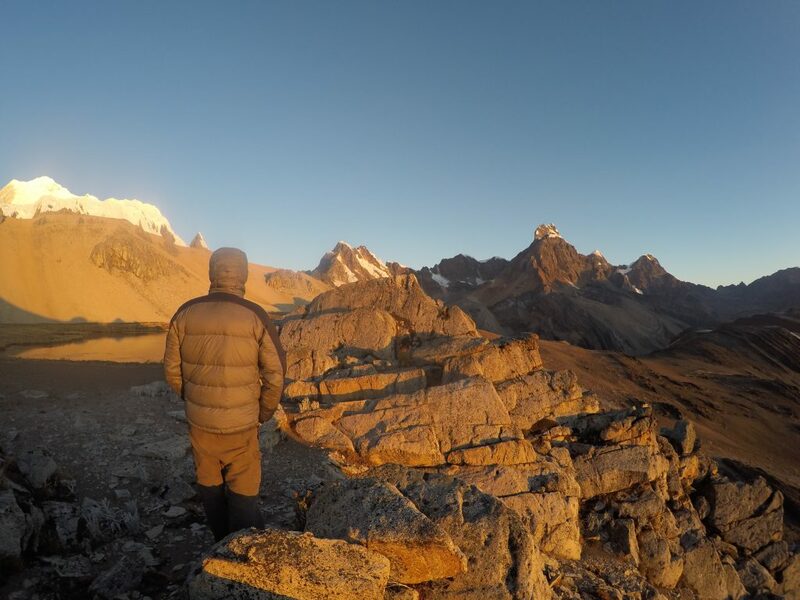 Part of our 13 day experience (8th July to 20th July 2016) was a mix of the Valley and Alpine Circuit but a significant (and more interesting) part became our own blank canvas as we tailored our route to our whims. 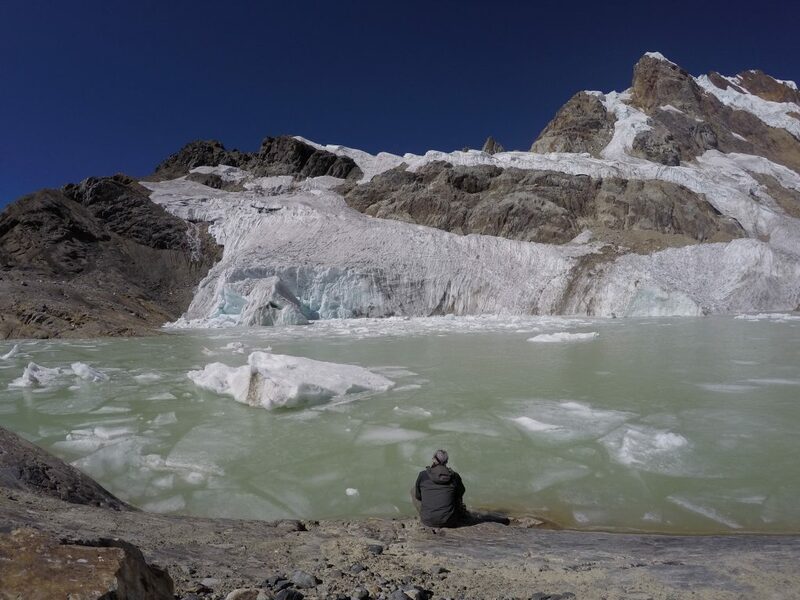 (NB: our route could be done within 9 to 11 days) We camped where we pleased, crossed huge ridges and valleys, swum in freezing lakes, and scaled a (sketchy) 5360m peak. Essentially we were making it up as we went along. Part of the normal Valley Circuit is so far away from the action it wasn’t hard to find the incentive. Also, perhaps it was the not knowing whether or not we could pass through some of these valleys that made it more exciting. In fact we ‘lost’ one day when our planned ‘short cut’ ended in a giant glacier and we had to turn around. This is definitely up there with one of my (and Adriana’s) best wilderness experiences. Ever. This view virtually had me in tears. 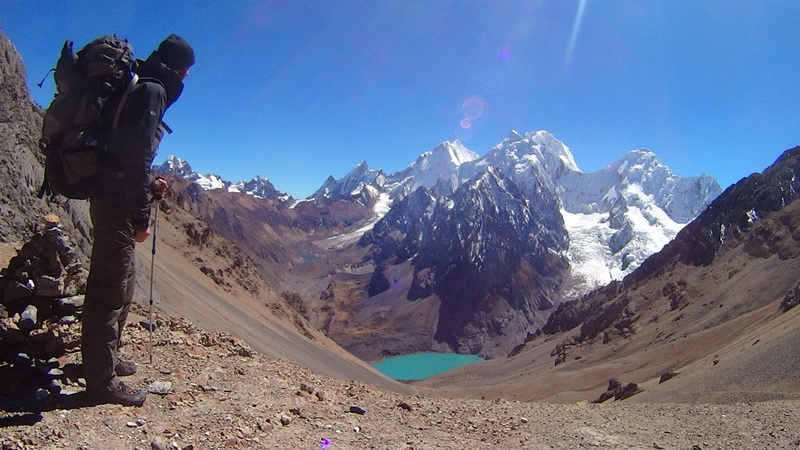 I plotted this ESTIMATE of our route AFTER we hiked Huayhuash. (Click ‘full route’ and then ‘export’ to download gpx.) Therefore it should be used only as a rough navigational guide of our route in conjunction with other more accurate topographical maps etc. 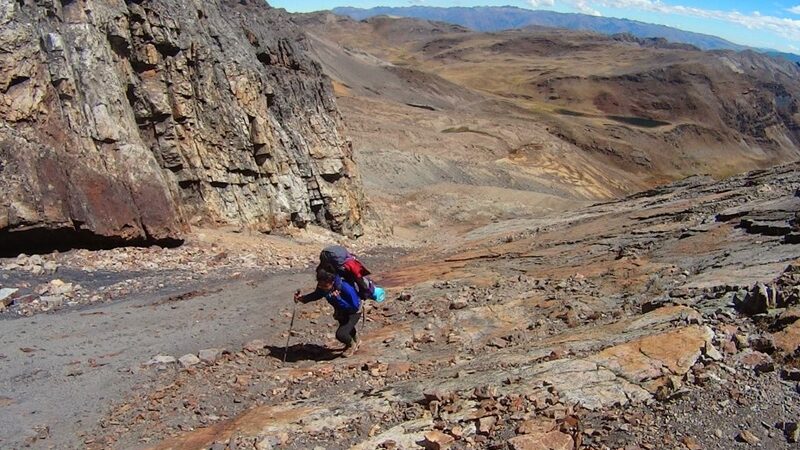 A couple of places like Diablo Mudo and the ridge at Cerro Grande require caution and common sense. 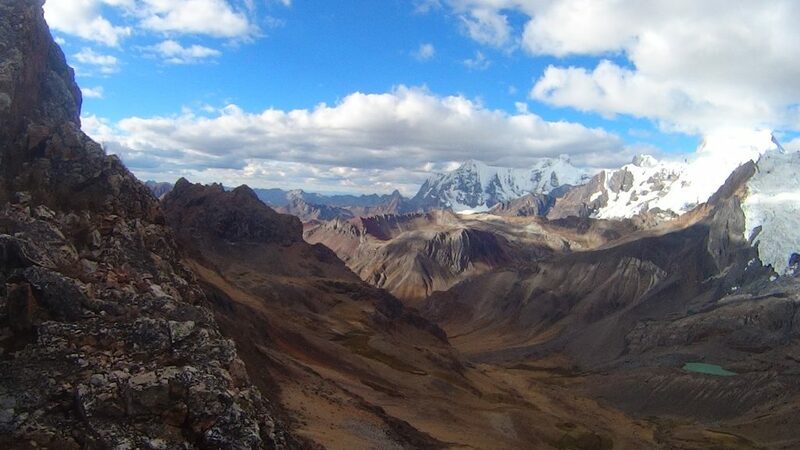 (Some people have come to grief on Diablo Mudo peak – continuing along the ridge was even more perilous). These poor souls looked pretty bored of carrying other people’s stuff. Understandable really. 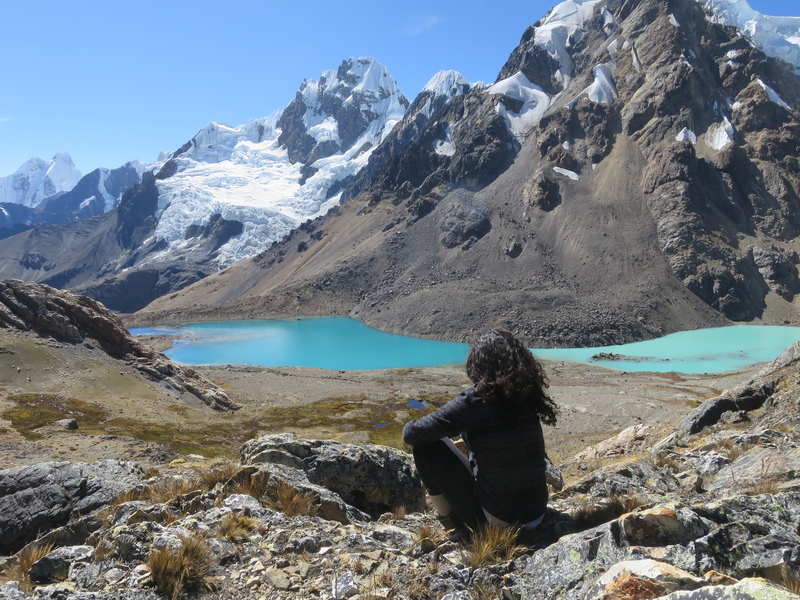 For Israelis, hiking the Huayhuash is so popular it’s almost like a rite of passage. One day we passed a group of about 30 of them when we had no option except to join the main Valley Circuit. 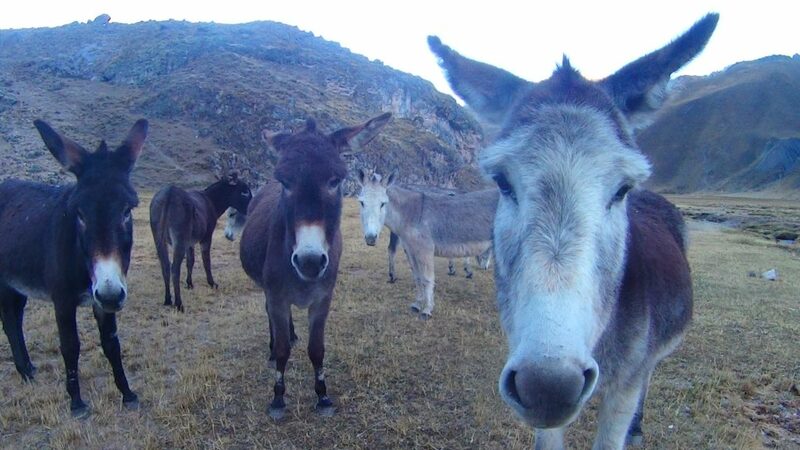 They’re known to have a reputation for poor behaviour but this group were perfectly pleasant which made me think that this was perhaps unfair. All too easy to judge a whole nation from a few anecdotal experiences. 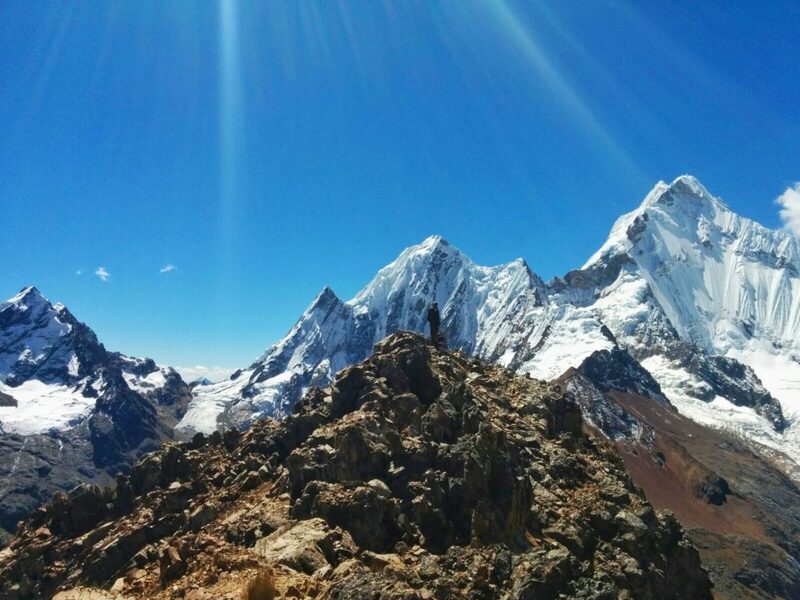 West side of Siula Grande (middle left peak) – scene of Touching the Void). Taken from Cerro Gran Vista. On the map it looked like we could safely sneak past this glacier into the adjacent valley cutting out a laborious descent to Huayllapa (and subsequent ascent). 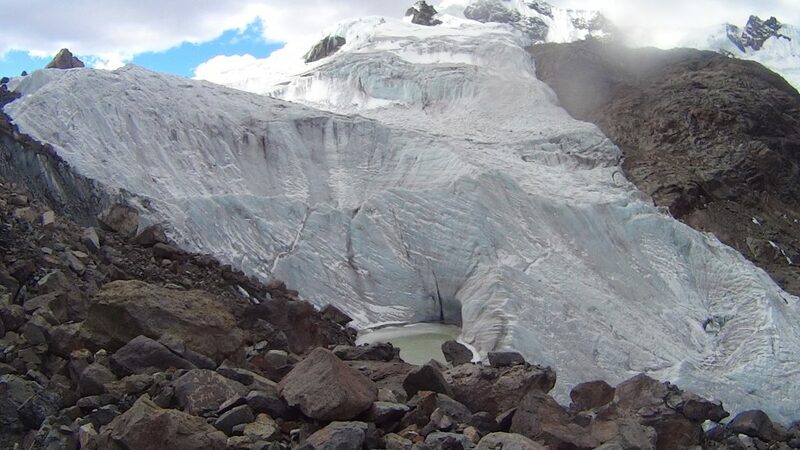 After climbing half the day to get up there it became clear that passing this glacier would be unsafe and we had to return which ‘cost’ us a day.. There is a shortcut somewhere though (I was told after by a passing local). It was with some doubt that we climbed up to the ridge that leads up to Diablo Mudo since it looks quite gnarly from below; this particular section was fairly steep but with very grippy rock. We agreed that we would turn round if anything looked too dangerous (like we did at the glacier) but we didn’t need to. When viewed from the first ridge the second ridge across the other side of the valley looked too steep to climb safely but this turned out to be deceiving and we had no problems. 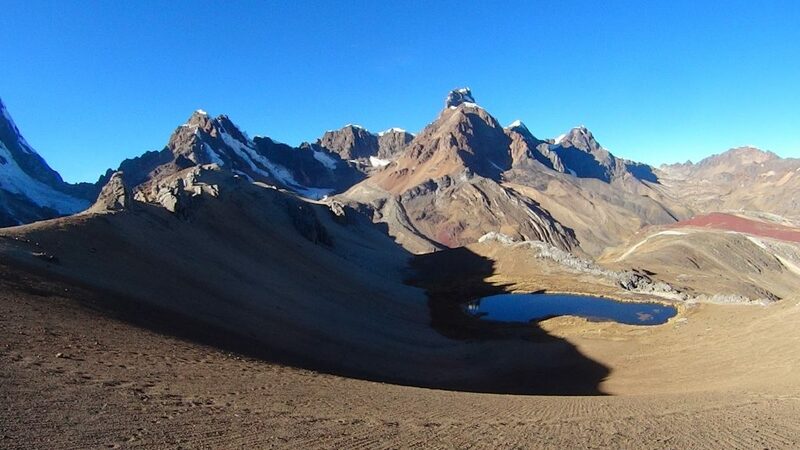 The video above is the top of Diablo Mudo (5360m). I climbed up from the lake with the help of a gpx whilst Adriana (wisely) decided to rest. This is a somewhat risky climb due to loose rocks and large drop offs. After scaling Diablo Mudo’s peak this ridge stretched out temptingly before me. Intrigued by the additional potential views on the other side I started down it with caution, vowing to turn around if it became too dangerous. There were a couple of semi-technical rock climbing manoeuvres that needed to be made which weren’t overly difficult but a fall could have been grave. I wouldn’t recommend it. I avoided walking on the snow at any stage due to crevasse risk. I was told that five years ago the ridge would have been covered in snow hence far more dangerous. A result of global warming perhaps? In fact a couple of guides I had spoken to incorrectly thought this was still the case so I wasn’t sure what to expect when I started up. On reaching the end of the ridge I could see the exact spot a hundred metres away where we had turned around due to the glacier three days before. It looked doable but it was hard to see the full route and to attempt it could have been reckless. 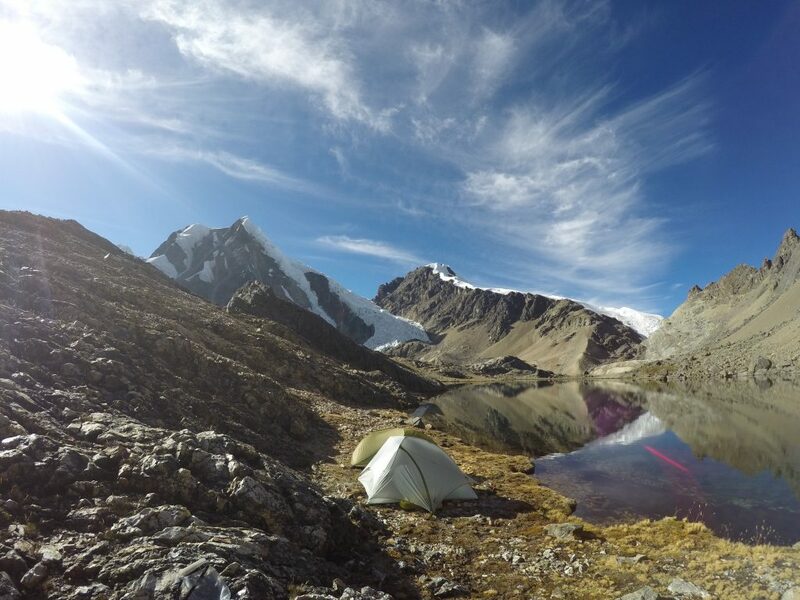 Two nights here – our basecamp (~5100m) for Diablo Mudo. After my morning climb we decided to rest here for the afternoon. A dip in the lake was invigorating to say the least. 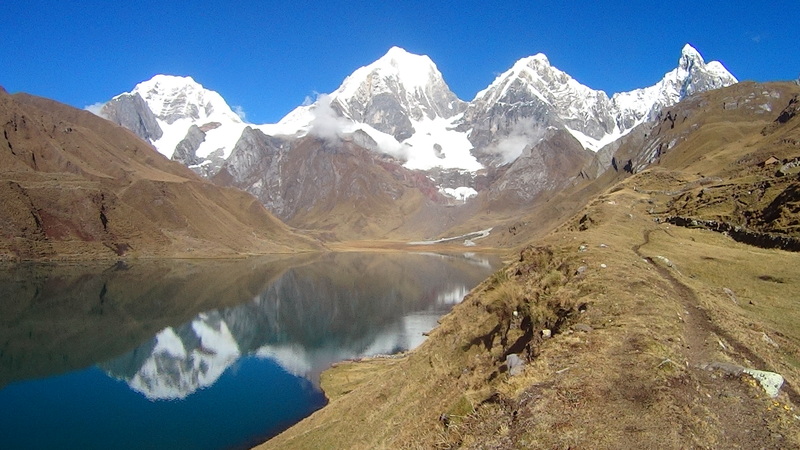 Next post: Finally I manage to leave Huaraz and pick up the famous Pikes route towards Lima. 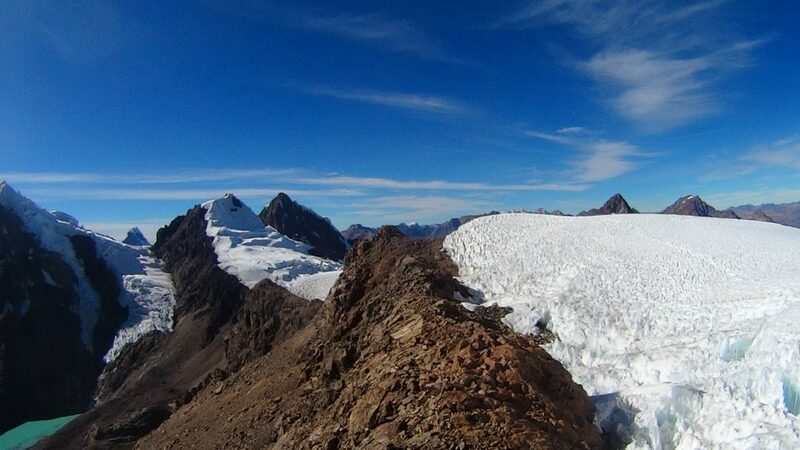 Awesome write up of this route! 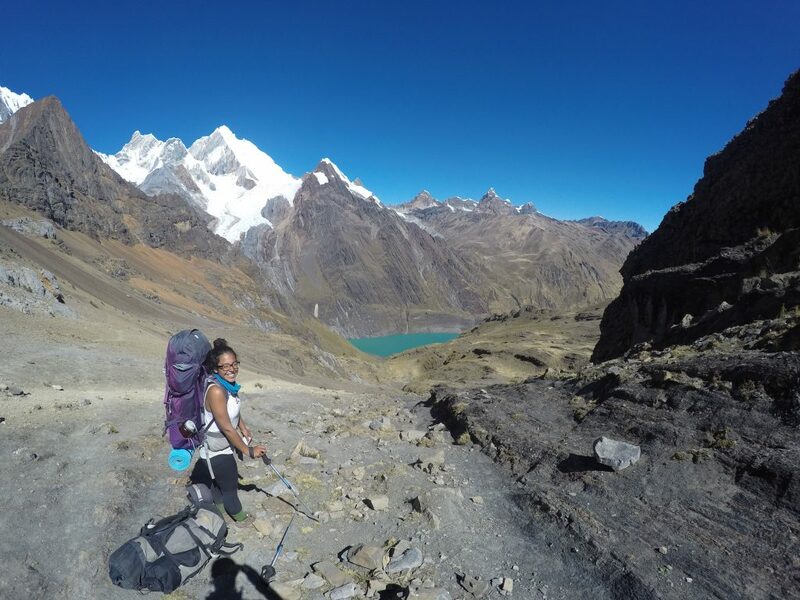 We are going June 1st and I am attempting to taylor the best route – much as you did… I have a question concerning the tail end of the hike….Starting at Lake Jurau (cocha) . 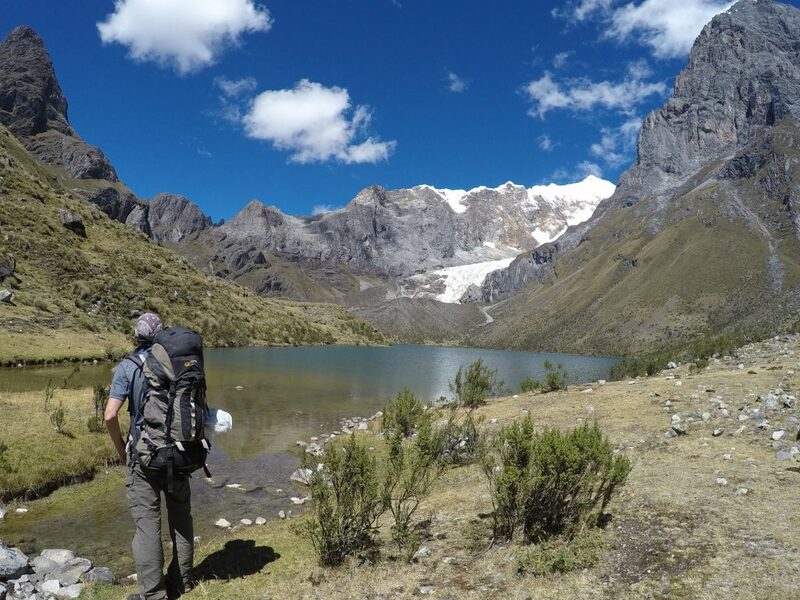 If i had two days for this part of the trail – which would you recommend: 1) Jurau Lake -> Sarapococha Valley -> over the top to Caramarca Lake (one day). Down valley (skipping your roadblock detour) the 2nd day. 2) spend the first day layed over at Jurau / day hike up the Sarapococha Valley. Down the usual valley the 2nd day. 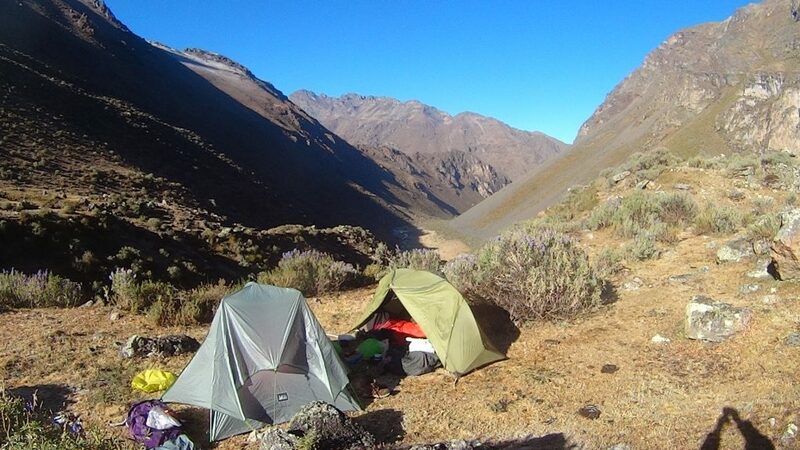 We camped roughly at the lake where Joe Simpson camped and took all day to get over to Laguna Caramarca (and camped again there by the lake). We did spend far more time than necessary exploring the ridge (probably added on three hours). 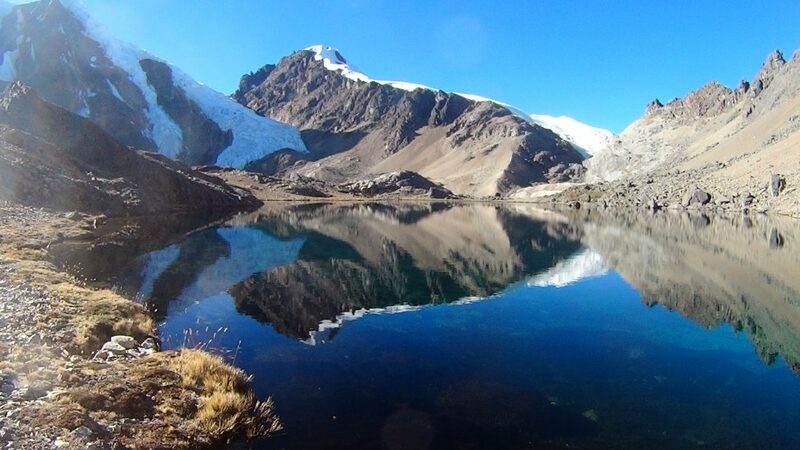 You could make it to Laguna Caramarca in a day from Jurau; start early to be sure. 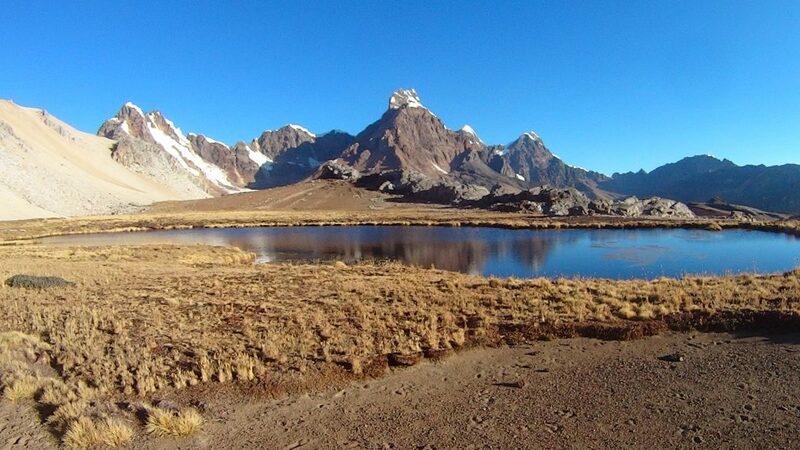 If you’re experienced and confident of your abilities I would hike to Laguna Caramarca. Down the valley (Segya?) shouldn’t take more than a two or three hours (I think) – bear in mind we were warned that this valley had bulls being bred for fighting (we had no issues but could have been lucky, who knows?). Yes skip the dead end detour, there may be an alternative way over without the big descent down to Huayllapa but I couldn’t be sure if it’s safe or even exists. Perfect – just what I needed to know. Thanks so much. I think we will try and do as you recommended. One last question… were there any bugs on the journey that warranted the use of bug spray? Our rule we had when doing the hike was to stick within our own limits and to turn round if something looked too dangerous for us. Seemed to work ok (except I think I pushed it a little far with the ridge at Diablo Mudo, plus my route up there had quite high risk of rockfall). Hi Simon! Delighted for you to use the gpx, assume you could download it ok? I felt the only really risky section was Diablo Mudo (the connecting ridge even more so). Worth bearing that in mind if you decide to take it on (maybe you did it before?). Let me know if you need more info. Great! 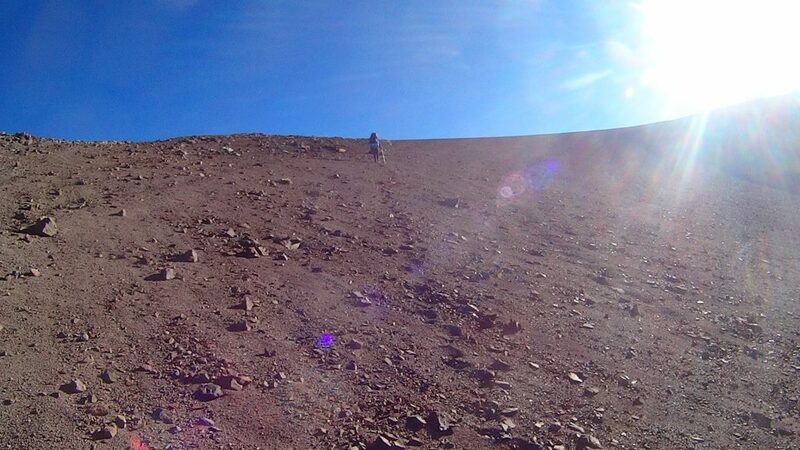 I have in the back of my mind to return to climb Ojo de Salado and ride some more of that desert. Fantastic touring terrain. Good luck with it all!